What Does the Catalonia Vote Mean for Spain? Scott Eastman, associate professor of transnational history at Creighton University, is the author, most recently, of the book "Preaching Spanish Nationalism across the Hispanic Atlantic, 1759-1823." There were “songs all day and far into the night,” and “down the Ramblas, the wide central artery of the town…crowds of people streamed constantly to and fro.” George Orwell’s portrait of the revolution that shaped the city of Barcelona in the first stages of the Spanish Civil War in 1936 might have also served aptly as a description of Catalans celebrating what has been billed as a referendum on independence on Sunday, Sept. 27. Swayed by the romance of revolution and what appeared to be a workers’ paradise, Orwell famously stated: “I recognized it immediately as a state of affairs worth fighting for.” And similarly, for most Catalans, the conflicts of the twentieth century centered on ideological struggles and the question of autonomy within Spain. The war ended with Barcelona, among the last bastions of a republic fighting forces aligned with fascism, attempting to hold out against Francisco Franco’s troops. The Nationalist victory ended hopes for continued Catalan autonomy, a provision that had been granted in 1932. Over a generation later, following the death of General Franco, the 1978 constitution definitively declared the “indissoluble unity of the Spanish nation.” Politicians of the transition, however, made sure to devolve significant powers and the right of self-government to Spain’s seventeen autonomous provinces. These included the teaching of regional languages and the promotion of cultural programs. Efforts were made to consign political polarization and the vestiges of authoritarianism to the past—efforts that have continued with the 2007 Law of Historical Memory. Yet in the aftermath of contentious and in some ways inconclusive electoral results over the weekend—with partisans declaring victory for separatism while others claimed anti-independence votes won the day—Spain appears to have fractured again, but this time along regional lines. With turnout exceeding 77 percent, pundits and politicians, including those from the conservative ruling Popular Party (PP), will point to the fact that the independence coalition, Junts pel Sí, received only 47percent of the overall vote (there were an overwhelming 11 lists of candidates to choose from, including a pirate party). From this perspective, Artur Mas and his independentistas did not earn a mandate. Factions such as the newer Podemos party, garnering 11 seats in the Catalan government in partnership with several smaller groups, have gravitated toward a middle ground, staking out an ecumenical position. While they hope the union survives, they believe Catalans should have the right to vote on independence. On the other hand, those pushing for separation, including the more radical Popular Unity Candidacy (CUP), will take 72 seats out of 135, effectively securing an absolute majority in Catalonia as long as they agree on a common governing platform (on Sept. 29, the CUP appeared to backtrack after Mas was criminally charged for his role in organizing the referendum of Nov. 9, 2014). How does this math work? The Spanish system is based on proportional representation, and the three districts outside of Barcelona elect an out-sized number of representatives to the Catalan parliament as measured strictly by population. In the district of Barcelona, more than 55 percent of voters rejected independence. The electoral controversy has focused attention on issues ranging from politics and economics to nationalism and cultural identity in Spain. The former Socialist Prime Minister, Felipe González, wrote a blistering open letter to the Catalans in the newspaper El País in which he compared an independent Catalonia to a 21st century Albania. Would Valencia, the Balearic Islands, and other Spanish regions follow suit, he asked? France, he huffed, would never tolerate this kind of irredentism. Surprisingly, González didn’t mention the Basque Country or Galicia, regions in northern Spain with some of the strongest nationalist political traditions. Economic tensions also have galvanized the push for independence since 2010 when Mas took over the helm of the Catalan government. Nationalists insist that the discrepancy between Catalonia’s percentage of the national GDP and the percentage of the national budget spent there in return is untenable. From a U.S. perspective, though, the fact that states like Alaska and Hawaii take in the most federal dollars per capita has hardly driven economic powerhouses like California to demand independence. In a stinging riposte to González, Mas insists that he truly loves Spain; he just cannot live under its jurisdiction any longer. As justification, he references medieval history and a supposed democratic lineage that dates back to the 11th century and the age of counts, nobles, and kings. Orwell ultimately became disenchanted with the workers’ revolution and extreme factionalization in 1930s Spain. He even noted that Catalans were not above the provincialism and bigotry common to the age, observing that some of the local soldiers “professed to look down on the Andalusians as a race of semi-savages.” Of course, immigration to the economically dynamic Spanish north has transformed the debate over culture and nation; today scarcely more than fifty percent of residents are Catalan by birth and heritage. 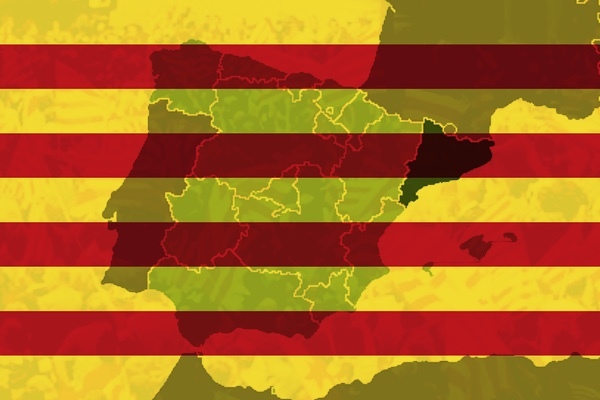 Is a pluralistic and multicultural Catalonia separate from Spain worth fighting for, albeit in the political arena? Is it even economically viable? Simply put, will Catalan independence secure a progressive and prosperous independent European state? Orwell himself might well have been disillusioned with the results of the election of Sept. 27.